In this defect, the pulmonary veins (PV), which carry oxygen-enriched (red) blood from the lungs to the heart for pumping to the body, are "anomalous," or abnormal with respect to how they return to the heart. There are various forms of this defect, but all of them involve the red blood from the lungs being carried by the pulmonary veins back to the right side of the heart rather than to the left atrium (LA), as in a normal heart. This means that all the red blood is mixed with the oxygen poor venous (blue) blood in the right atrium. 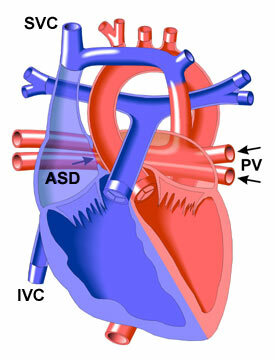 To get to the body, blood must cross through a hole in the atrial septum (ASD). In the most common form of this defect (shown in the diagram), the pulmonary veins (PV) are connected by a vessel to the superior vena cava (SVC), which carries blue (oxygen-depleted) blood back to the heart. This is known as the supracardiac type. There is usually no obstruction with this type of anomalous veins. Less commonly, the pulmonary veins may be connected to the inferior (IVC) vena cava (infracardiac) or to the right atrium itself (intracardiac). It is also possible for the veins to be of mixed type. For example, the left sided veins may return via a supracardiac route and the right sided veins via an infracardiac route.